5/21/12 After 75 miles on the ICW, we arrived in Charleston Harbor. Most of the day the waters were very calm, but as we entered the harbor, it was rougher water. We headed up the Cooper River to the Charleston Maritime Center Marina which is within blocks of downtown. Our looper friends, Jenny and Jerry Reves invited us over for cocktails and generously loaned us their truck for the week. 5/22/12 We toured Middleton Place Plantation today....the gardens, the house, the slave quarters and grounds (via a buggy ride). Lunch at the plantation was one price regardless of your selection. For $20.00, we chose from a variety of soups, salads, entrees and desserts. 5/23/12 We were able to catch the ferry near our marina for the tour of Fort Sumter. Dinner with Jenny and Jerry was at a new Italian Restaurant...very good. 5/24/12 While Ron took a water taxi across the harbor for a tour of the Yorktown and the Laffey, I got a haircut, did laundry and did some shopping. I finally selected a sweet grass basket after visiting nearly every vendor. Sweet grass baskets come in many shapes and sizes. They were originally made by African American women in this area,and the skill is still taught to young children. Very small baskets sell for about $35.00. The more ornate, large baskets sell for up to $200.00. 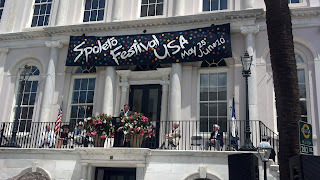 5/25/12 Today was the opening of the Spoleto and Piccolo Spoleto Festival. We attended the opening ceremony at city hall with Jenny and Jerry. Afterwards, we ate at Slightly North of Broad (SNOB). Since we did not have a reservation, they asked if we would be willing to eat at the community table. We accepted the offer and sat at the counter facing the open kitchen. Evening found us at a Piccolo Spoleto event....an Irish group known as The Teetotallers.....they were fantastic. Members of this group are John Doyle (guitarist), Martin Hayes (fiddle), and Kevin Crawford (flute). For the next two weeks, many music, theater, and dance groups will perform. Spoleto originated in Spoleto, Italy. The USA version came to Charleston 36 years ago. Piccolo Spoleto was a more affordable version of the festival. 5/26/12 One of the Spoleto events which is most popular is Chamber Music (the St. Lawrence Quartet), and it lived up to its reputation. We sat 2 rows behind the mayor of Charleston. He has been mayor for 30 years and is attributed with bringing the arts to Charleston. Afterwards, we had lunch at a casual French restaurant, where again there were community counters so that you could interact with other diners. Following lunch, we toured one of the mansions. We had planned to leave Monday am, but another tropical storm is headed this way. We don't expect a direct hit, but seas will be high. Beryl is expected to make landfall in Jacksonville,FL, but we will have to wait and see. We attended St. Patrick's Catholic Church in Charleston. It is a primarily African-American parish which is celebrating its 175 anniversary. Several parishioners came up and personally welcomed us and all guests were recognized during the service. 5/27/12 Tonight we attended an old fashioned (Gullah) Camp Meeting presented by the Mt. Zion spiritual singers. This was a reenactment of an African-American prayer meeting from the late 1800's-early 1900's. Gullah speech was a little difficult to follow, but very interesting! 5/28/12 Memorial Day---What a difference a day makes....Since the small craft warning was cancelled, we were told we no longer had a slip at this marina. Someone else had reserved our slip for a week, so we have to leave, even though there is still a small craft advisory. We had a very rough departure. We turned out of our slip and navigated to the gas dock for an overdue pumpout, and then headed out into Charleston Sound. Four footers in the sound hit us on the nose, so the 4 miles were tolerable. Once we entered the ICW, the waters calmed down and we had only occasional rain. We pulled in to Leland Oil Co. for fuel and overnight dockage about 2pm. There was not much here, but it afforded us a safe harbor. 5/29/12 Tropical storm Beryl is headed back north as it turns out to sea. Heavy rains of 3 to 6 inches are predicted with sustained winds of 35 to 40 mph. We've decided on a short day of travel so that we can tie up before the storm hits. Our destination of Georgetown was reached about noon. Lunch and dinner at some small cafes downtown preceeded the storm which arrived during the night. Heavy rain and some wind, but nothing severe occurred. 5/30/12 Several boats pulled out early during the storm. We are much more cautious and will spend the day in port visiting Georgetown shops and catching up on necessary paperwork. We were delighted to share Charleston with you duing one of the most exciting times to be in Charleston during Spoletto. Thanks for sharing your "adventures," which I can live while living on the "other" Coast. My sister (visiting from Illinois during the last week of May) and I got to see five lighthouses on her trip - and had an "inside" tour of the Umpqua River lighthouse, about 20 miles south of Florence. "Primal" best describes our Atlantic and Pacific coasts. You've faced a lot of weather out East, but there appear to be a lot of places to harbor. Most pleasure boaters out here do "lakes" because "ports" are few and far between on the Oregon Coast. There are only two Power Squadrons on the Oregon Coast - Astoria and Coos Bay. The four Squadrons in the Portland area consist of mostly Columbia and Willamette River boaters. My Squadron friends in Coos Bay know about the Great Loop, but they didn't know that Peoria was on it. (I guess when I transferred membership, they couldn't believe anyone from Central Illinois owned a boat or that there was water to put it on.) Now that I've set them straight, they all send you their best wishes!